Bird crafts are perfect for letting kids use their imagination to create their own unique art projects. 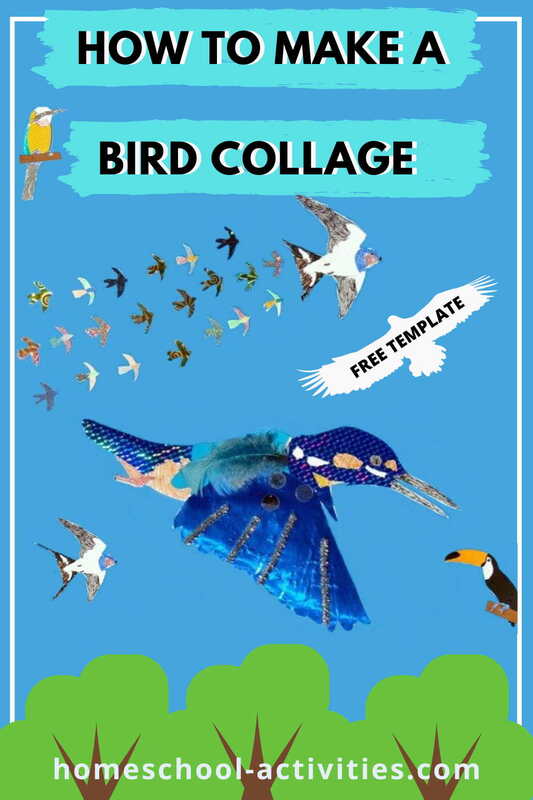 This lovely bird collage has free printable templates. Lower down the page you can see how to use bird crafts to make wonderful fabric projects perfect for cushions, pillows and fabric painting. So you can have fun seeing how to make a kingfisher and a flock of swallows from things you have lying around in the craft box. Our homeschool project is one of those fun art projects which you can pretty much adapt to what you have in the house. We'll give you some ideas so you can create your own unique design. My daughter Catherine and I made this homeschool bird collage together when she was seven. Older kids will enjoy it even more and younger kids will need you to join in - which is always the best part! As far as art materials go, the most essential ingredient is plenty of holographic paper. I find the colors you get are ideal for all sorts of art projects for kids. Our homeschool crafts take advantage of holographic paper to mimic the beauty of feathers. You'll find two homeschool free printable templates for the kingfisher and the swallows. You'll see Catherine and I made a homeschool bee eater and a toucan too - you can choose whatever bird friends you like to add to your collage. You can download the free template by clicking on the Kingfisher link here. You'll see the kingfisher Catherine and I chose is European, but luckily all kingfishers have the same basic shape! So you can pick and choose from whatever holographic paper you have to use our template to make a Belted Kingfisher or a rather more exotic species yet to be discovered! If you want to see some photos of real kingfishers and swallows to base your art and craft ideas on, allaboutbirds.org has photos, videos and even bird calls to help inspire you. And, for bird crafts of a different sort, have a look at our needle felting page. Download the Swallow template by clicking on this link. Swallows are some of the most lovely subjects - as well as being my favorite bird! 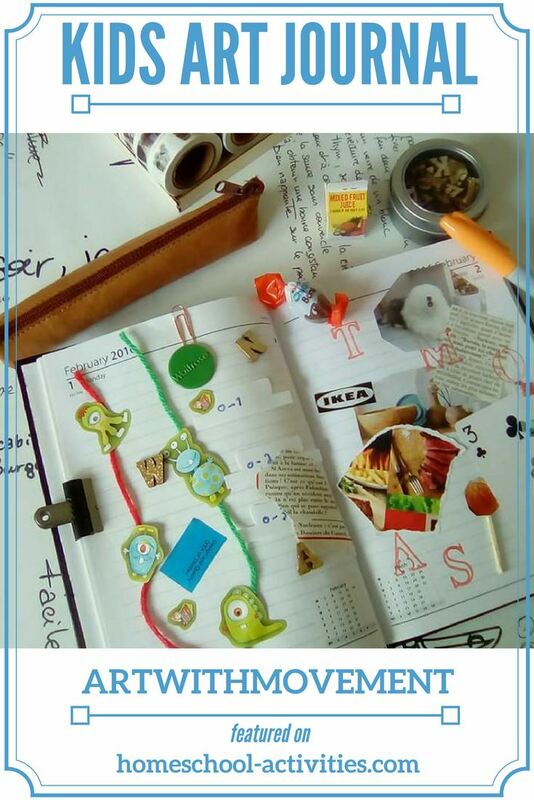 Our free homeschool template gives you an outline shape to copy. Catherine colored her homeschool swallow using gel pens, but you can easily cut the shape out from any suitable bright paper you have. It might be fun for kids to use a fabric material which is blue and shiny. I really enjoy making the most of different materials for art projects for kids. The smaller swallows you can cut out of holographic paper and turn into your very own homeschool flock. "My 10 year old daughter Makayla got an easel, acrylic paint and a canvas from her uncle and aunt. This was her first attempt at painting on canvas. Bird crafts are such a wonderful way of learning new techniques and there are so many different ways to enjoy them. 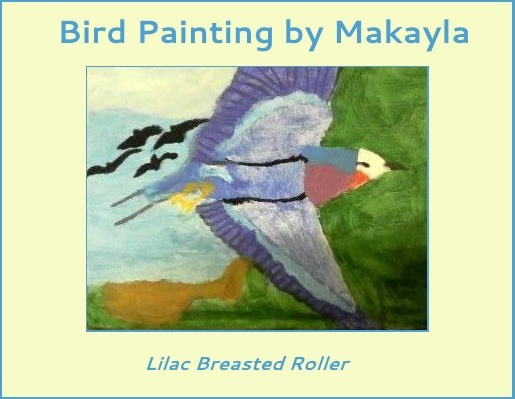 This wonderful painting by Makayla shows tremendous artistic talent as well as being full of joy and happiness. It just shows that following your child's interest in birds leads on to all sorts of learning opportunities. 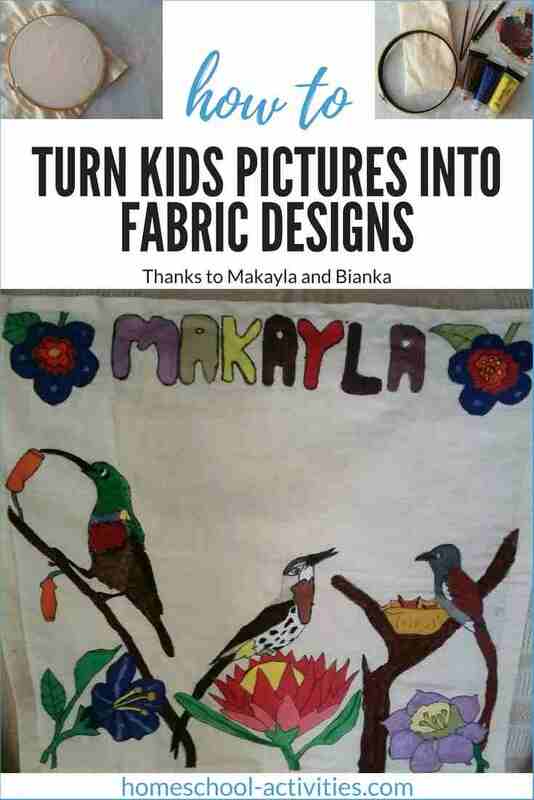 Makayla and Bianka are now making even more exciting bird crafts! I asked them to share how to make something unique and beautiful on material. "Makayla painted birds and flowers onto material, we are going to use it to make a pillowcase. Here is what you need and how to do it. Some newspaper to cover your work surface. Paper towels to clean the paintbrushes with. A plastic cup for water to rinse the brushes in. Find pictures to trace onto the material or draw your own. A piece of material, we used unbleached linen. Black marker to trace around the edges after it is painted. Gray pencil to draw with on the material. Palette to mix the paint on. After drawing your pictures onto the material we used the embroidery loom to stretch the fabric nice and tight to make it easier to paint on. There is so many possibilities which you can choose from on what to do with the finished product. The next one is going into a frame. If you'd like to have a go at making this fun bird mask from a paper plate, have a look at our free craft activities for kids page. 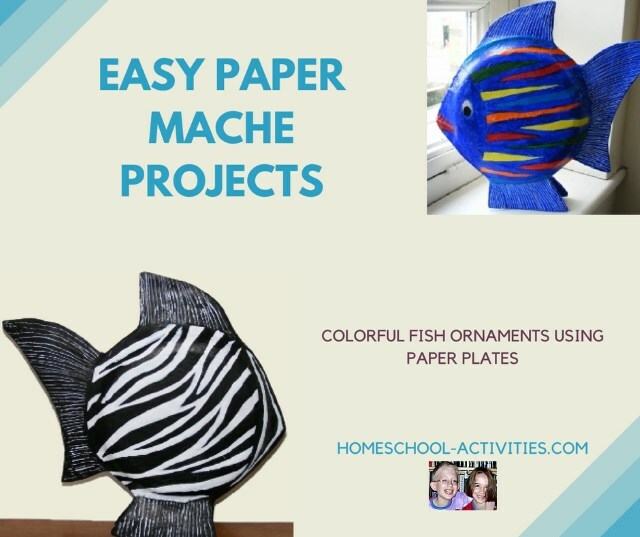 Paper plates come in really handy to make paper mache fish ornaments. Owls would be great for a bird mask. You'll see we have made a nocturnal scene with a bat and an owl on our page on Halloween activities for kids. 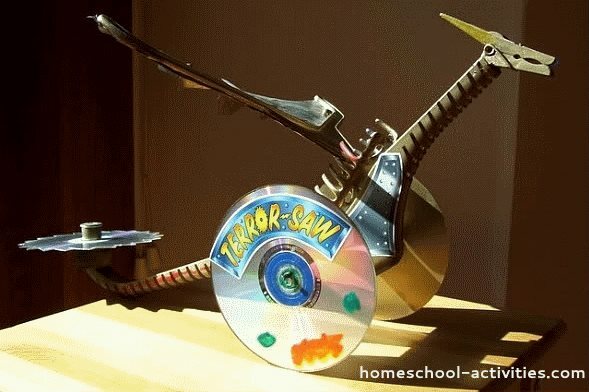 There's a homeschool bat mobile to make too! I hope we've inspired your kids to have a go at trying out different materials to create fantastic bird crafts of their own.